Since joining Pinterest it has truly changed my whole blogging strategy. Before Pinterest, I didn’t get any traffic to my site and I didn’t have any engagement on any of my blog posts. Soon after jumping on Pinterest and creating a solid strategy my traffic and engagement went through the roof. My email list growth also increased when I jump on Pinterest. Another important factor while growing a blog is the email list. I didn’t know how important growing an email list was until after I created my blog but currently my email list is the leading factor in growing my income and turning my blog into a successful business. If you want to build a solid connection of trust with your readers having an email list is a must. At times, most readers might not always see your social media updates but with an email, they will get sent your content directly to their inbox. Also, if you are looking to create any product in the future such as courses and ebooks having an email list will definitely help with the sales as you build trust with your list of loyal subscribers. 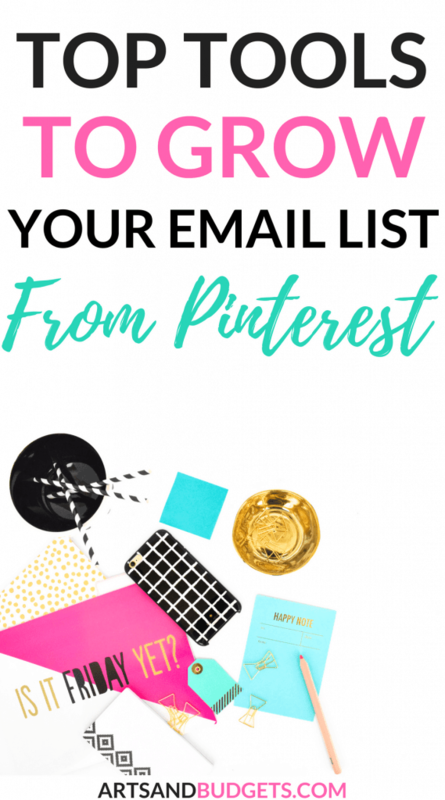 Because of that, Pinterest has been one of my go-to platforms to grow my email list. Throughout my journey, I have noticed a few tools that have helped boost my Pinterest experience. This post will share some of the top tools to help build your email from Pinterest. 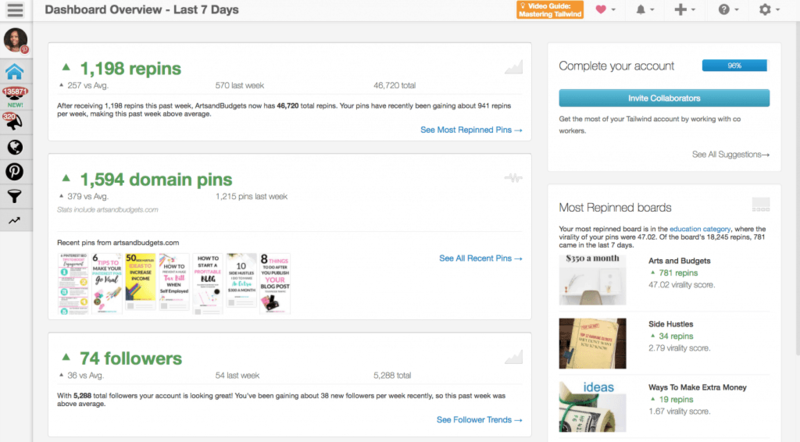 Another tool that has helped me schedule different Pinterest posts is Tailwind. I learned about Tailwind soon after I started my blog and signed up immediately after the great stories I heard about how it helped grow many blogger’s traffic. After I signed up for Tailwind I noticed the boost in my traffic as well. I was also able to schedule pins on autopilot for the week and even month. Tailwind also has a very detailed dashboard that shows you, Which of your pins were repinned the most, The times your most popular pins were repinned, The number of followers you gained, Your recent comments and your most re-pinned boards. Knowing which boards and pins perform the best is HUGE! It will help you focus your energy on the boards and pins that do the best to maximize your exposure. Below is an example of the Tailwind dashboard. Tailwind Analytics: Tailwind analytics help keep track of how your Pinterest page is performing. In the analytic section, you are able to track your growth on Pinterest and measure your performance and analyzed all your efforts on the platform. Pin Inspector: This feature shows you how your pins are doing and list the number of likes, re-pins, and comment accumulated. This feature will help you figure out which pins are performing the best from Pinterest. Tailwind Tribes: Tribes are another way to promote your content to grow your email list. Tribes are very similar to Pinterest group boards because you can request to join. After getting accepted into a tribe you are able to share content with other bloggers and repin the content to your boards and your group boards. With the Tailwind Tribes, you are able to start a new tribe and add new contributors to each tribe that you create. After you add someone new they will be able to share their content and repin other contributors pins as well. Tribes can help grow your traffic and help boost your pin repin and save rate. Best Time To Pin Feature: I really love the best time to pin feature because it shows what times are best for you to pin on Pinterest based on your repin rate from the platform. If you are looking to grow your email list fast one of the quickest ways is to check how each of your pins are performing on Pinterest. To check out how your posts are performing on the platform you can use Google Analytics. Google Analytics is a free tool where you can check out how your website is performing and how your pins are performing on Pinterest. You can actually find out your best-performing pins using this platform. Finding out your best-performing pins can help with figuring out which posts to focus on to build your email list. I check my Google analytics weekly and it has helped me figure which posts to focus on to grow my list. To find out how to find your best-performing pins on Pinterest click here to read this post which shares full details at the end on how to find your best performing posts on Pinterest. If you are looking to grow your email you will need Pinterest pins that stand out. A great site that has an easy to use the platform to design your pins is Canva. Canva is seriously one of my favorite free platforms to design my Pinterest pins and blog images on. On Canva’s free version you can create Ebooks, logo, Pinterest pins and more. If you are looking to save money on your blog designs this site is perfect for you. The site even has templates for each social media platform such as Twitter, Facebook, Instagram and more. It’s my go-to site if I have to design anything. Another awesome platform to design Pinterest pins on that a lot of bloggers use is PicMonkey. Like Canva, Picmonkey is free and very easy to use to design Pinterest pins on. You can also create logos and ebook covers on this platform as well. Since Pinterest is a search engine it’s super important to utilize keywords on the platform. One of the ways to become searchable on Pinterest is by putting keywords throughout your profile. Keywords are how people find your Pinterest pins. If you don’t have any relevant keywords in your Pinterest pin descriptions and someone looks up your blog topic, they won’t be able to find those pins on the platform. If people can’t find your pins then they won’t be able to go to your site to join your email list. That’s why it’s uber important to plug in keywords throughout your profile. Places, where to put keywords, are in your business name, pin descriptions and in your board title and descriptions. Keywords help with making your profile searchable on Pinterest so it’s super important to utilize them on the platform. A great place to find keywords is from Google Keyword Planner. Google Keyword Planner is an excellent FREE tool that you can use to get ideas for keywords for your blog posts to add to your pin and board descriptions. Simply go to Google search and type in, “Google Keyword Planner”. When you get to the main page make sure to click the “Skip the guided setup” option. If you don’t click ” Skip the guided setup” you will be directed to set up ads. I did that the first time and it took forever to figure out to just use the google keyword planner. Google keyword planner has been great for finding the perfect keywords to use for my pin and board descriptions. 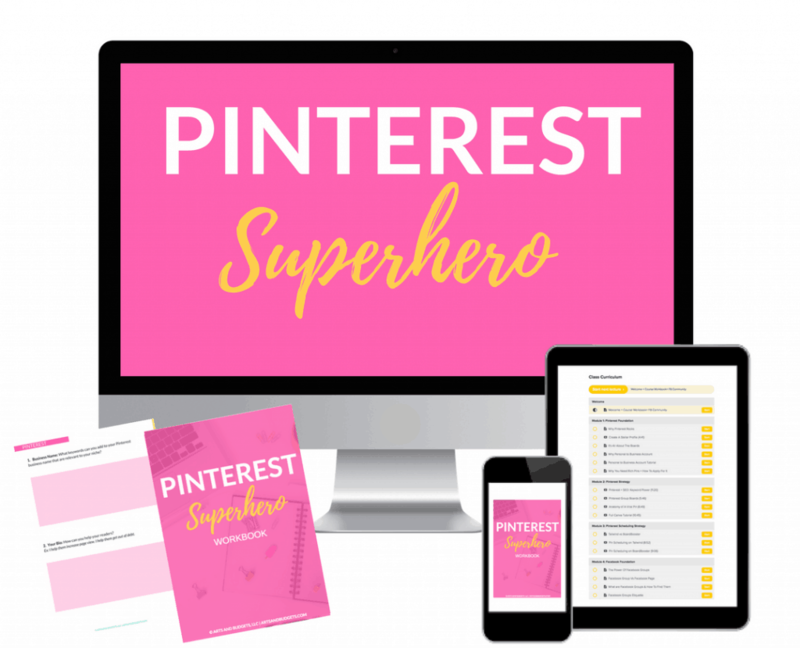 I go into much more details about keyword research and Pinterest SEO in my course, Pinterest Superhero! Another way to make your Pinterest pins more clickable is from the title of the pin. You want to make sure your titles stand out so that users will click on it to go to your website. If you are Looking for the best headline titles for your blog posts check out CoSchedule headline analyzer! 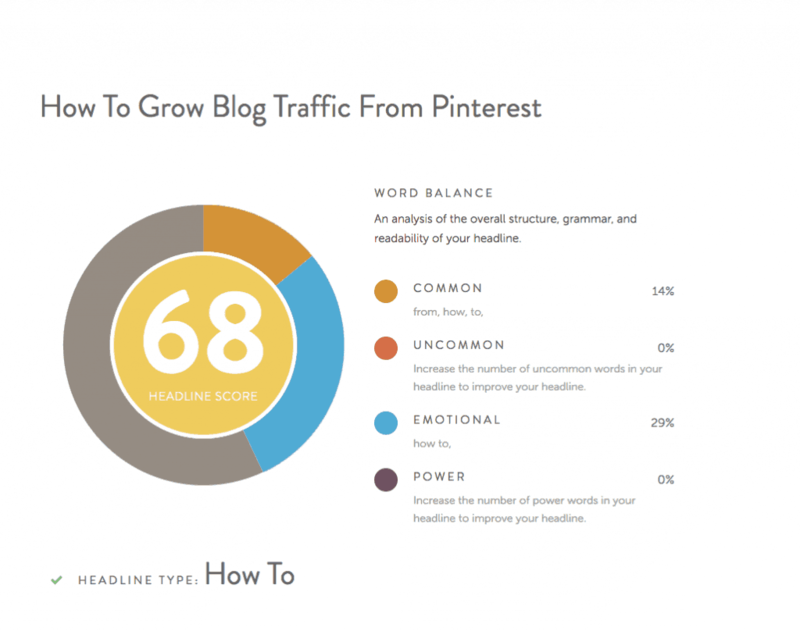 It’s a free tool you can use to help develop strong blog post titles. It also gives you a score to help analysis your titles and strengthens them. In the example below I typed in the title “ How To Grow Blog Traffic From Pinterest” and the app gave me an overall score of the title I suggested. Check out the app here! You can also check out this helpful article on how to write strong titles by clicking here! If are you looking to grow your followers on Pinterest and your email list Milo tree is a great app to use. I just recently starting using it and I have seen an increase in my Pinterest followers since doing so. Once you sign up you just have to connect the platforms that you want to grow then add the pop-up to your website. It’s really easy to use and awesome to have on your site if you are looking to grow your followers and email list quickly. Probably the biggest and fastest way to grow your email list on Pinterest is from Pinterest group boards. With group boards, you join other blogger’s boards with other contributors and pin your Pinterest pins to the boards. What I have noticed about group boards is that it’s super important to pin relevant pins to relevant boards. For example, if I created a pin titled, “How To Grow Blog Traffic This Month” I would repin that pin to relevant group boards that focus on blogging tips and resources. I wouldn’t repin the pin to boards such as money making boards and fitness boards because the pin didn’t focus on those areas. There are a few ways to find group boards on Pinterest. The first way is by searching through other bloggers in your niche Pinterest profiles. Simply look for the boards with the multiple faces in the lower left-hand corner as seen below. The boards below are all group boards. After that, go the group’s bio and look for instructions on how to join the board. Most admins will ask you to follow them and email them to request to join. Each admin of boards will have their own set of rules which are normally in the group’s bio as well. The second way to find group boards is Pingroupie. Simply go to Pingroupie.com and type in relevant keywords of the type of boards you are looking for in the search box. After that, different boards on Pinterest will populate and you can request to join them after viewing how to in the board’s bio. There you have it! 6 Tools to grow your email list from Pinterest! OMG! These are some great strategies! I am still trying to figure out Pinterest, but I will admit that I had underestimated it until I saw that just those few unfocused pins have been the number one source of blog traffic for us. Thanks for giving me ideas to help focus our efforts! These are some great tips, I’ve been using Tailwind for a little while but I don’t think I’m consistent enough with it! Thank so much, Krystin! Tailwind is definitely one of my favorite schedulers when I schedule posts. Pinterest sends me a decent amount of traffic, though it is not my primary source. These are some good tips to step up the game. Confession: The unending changes to Pinterest algorithms throw me off. Today, for e.g., my monthly views are down to 0 from 89K–in one night! Makes me doubt Pinterest stats because of these hiccups. Yes! I could not agree with you more, each of these tools has helped me so much. Tailwind Tribes are also really key lately for me to get more repins and clicks. The one thing I would mention is using Google Analytics to track your pins performance. So, if a pin is doing really well you can pin it more or know that that design converts. Thanks for bring these disparate thoughts/tools together for me with strategy! What a wealth of information this post is – pinning also! I’m really working hard on Pinterest this year so these tips were really useful! This is fantastic! I just discovered the co-schedule headliner tool and I love it. It has helped me SO much.